Plot Outline: It is three years after the Clone Wars. The leader of the droid army, General Grievous, has captured Chancellor Palpatine on board his ship, the Invisible Hand. Jedi Master Obi-Wan Kenobi and Jedi Knight Anakin Skywalker must fly through Coruscant safely, and enter the Invisible Hand so that they can rescue the captive Chancellor. Just when Palpatine is about to be released, Count Dooku shows up. Obi-Wan and Anakin both battle it out with him, but Obi-Wan ends up unconscious. Anakin slices off his head and kills him. Anakin carries Obi-Wan, and Palpatine follows him. They meet General Grievous face to face, and Anakin tries to fly the last half of the ship so that they can safely land on Coruscant. Later, Palpatine starts acting strange, constantly manipulating Anakin into believing that the Jedi Council is against him. Eventually, it is found out that he is the Dark Lord of the Sith. Jedi Master Mace Windu fights him, along with three other Jedi that accompany Windu. They all fail. 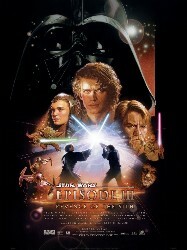 Anakin becomes Darth Vader, believing that he can save Padme from death by becoming evil. After a fierce battle between Obi-Wan and Anakin, Anakin gets fried by the lava at Mustafar. Palpatine takes him to a medical facility, where he gets fake legs and a fake arm attached to him, along with a breath mask, and a helmet. And thus, Darth Vader was born... the Death Star is shown under construction, a weapon of mass destruction that is sure to be used in the future.